Amplified USB circuitry extends any USB connection up to 60' long. Use up to 4 of these like extension cords. 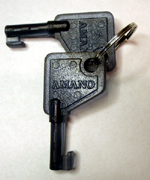 Factory Original Master Key for Acroprint punch clocks. Models 125, 150, and 200 (only). Guaranteed to work. If you CP3000 is just cycling and the display is flashing, 9 out of 10 times this is the problem. Replace it. Sensor assembly kit. Replaces original upper optical sensor assembly, this is the one that breaks. 50 employee time and attendance software for Compumatic time systems products, and various hand punch readers. Power supply for Icon data terminals including SB100, TimeCalculator, and the RTC1000. Rapidprint Date/Time stamp master key. Why use anything else, this works every time. Amano time clock key. Fits PIX3000, PIX200, MJR7000, MJR8000, EX6000, 9000 and more. One key on a "company key fob". Acroprint 110AC Motor and Brass Minute Impulse Cam. Do it all at once, do it right. We tell you how to do it. Fits both Acroprint 125 and Acroprint 150 plug in machines. Acroprint Model 125 Stamp Hammer and Platen. Swings up from the bottom, hits the card and ribbon. Is your handle wobbly? Broken? MISSING? Does it jamb? Get a new "handle" on the problem and replace it! Metal #700 key ... We've got'em! Plus, you get a long lasting dark purple ribbon, that is Made In U.S.A.
Lathem motor. One year guarantee. Fits all mechanical Lathem time clocks. We can show you how to install it! One Year Guarantee. Lost the key? We have them! Original factory key for all Lathem mechanical metal-case) time clocks. If in doubt, just call us. Lathem Dial Plate Assembly. Models 2000, 3000, and 4000. If the hands spin freely, this is the part, you can do this. Lathem Sonachron Battery. This is the solution for 99% of all Sonachron problems. This is the Lathem DWA-S.
Pyramid 3700/4000 time clock ribbon and master key. If you need the key, we ship it with a ribbon VIA UPS in USA, US Air mail (a week) to all others. Rapidprint/Widmer Motor. Better than the original. Guaranteed one year! We fix these machines. Hand Punch Keys. 1003 master key. In stock, we ship fast. We can also repair your hand punch clock. Replacement plastic mounting plate for Icon Time Calculator and all models since 1992 including: SB100, RTC1000 and TotalPass. Rapidprint PC Board for Rapidprint AR-E, ARL-E date time stamps. We stock employee time clock parts, time clock motors, and more. Find it here, or call us. Fast shipping, great resources.